The most current photo of our living room (although missing our 2x4 Jalousie Rear Media Console), sports different curtains than the free bedsheet fold top curtains I sew before we moved upstairs. 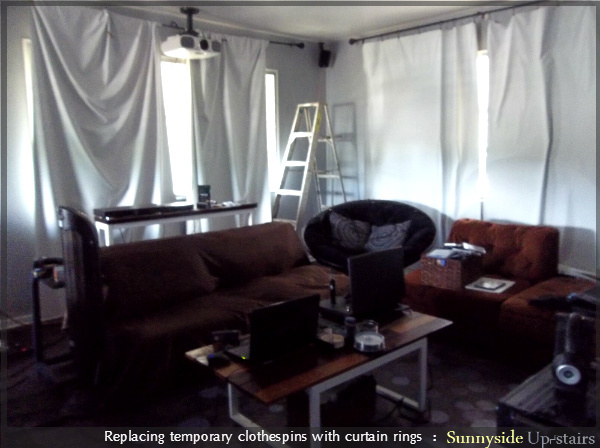 In April, as we were settling into our unfurnished apartment, we installed a home theater system and blackout curtains. 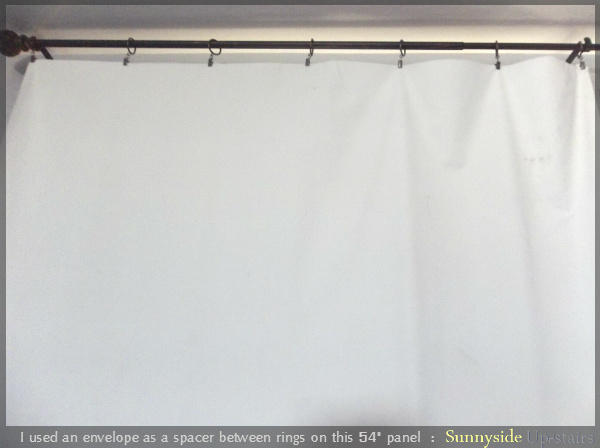 I ordered 54'' Wide Roc-Lon® Blackout Drapery Lining from Amazon.com at about $6 per yard. Using 10 yards, our new living room blackout curtain fabric cost me about $60, which is $60 more than our free bed sheet fold top curtains now in the nursery. 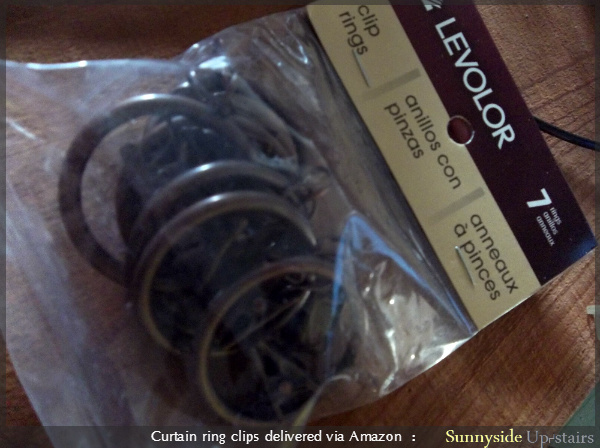 Originally, I clipped the blackout curtains with clothespins until we purchased the first set of curtain rings I've ever used: Levolor Classic Clip Rings, Set of 7, Brushed Sienna, also from Amazon.com, which cost a total of $32 for 4 sets, the same price as the curtain rod and finial sets I purchased from Ross. This has put a defined dent in our living room furnishing budget, in the shape of $92 for our blackout curtains, or $124 if you include the cost of the rods. I spent $124 to cover my windows with blackout fabric? Ouch. $34 left for repairing and slipcovering those sofas...uh oh. Although the price is not favorable for my budget, the blackout fabric is great because I learned I didn't need to hem it. It doesn't fray at all. I cut leftover pieces into a curvaceous bracket shape for my watercolor blackout shades, and the fabric has held the shape of the cut. The 54" width was perfect for each of my windows, so all I did was unroll the bolt of blackout liner, cut 90" lengths per panel, and string the rods with the clips to prepare for hanging. I used an 8" wide envelope to help guide my clip spacing. 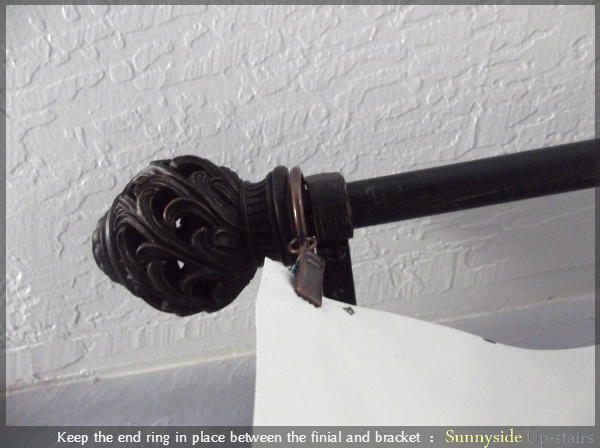 When the curtains were hanging, I straightened the bottom "unhemmed-line" by simply pressing the fabric against my baseboard, marking a line in the crevice, and running scissors through the line I marked. So simple! Sooo sweetly lazy. Taking photos with blackout curtains drawn proved to be difficult, but I did capture a photo during the process (please excuse the disorder). After everything was installed, the room became deep and moody and I then missed my free, wispy bedsheet curtains. The blackout liner does serve its purpose in our living room home theater and blocks out considerable light. 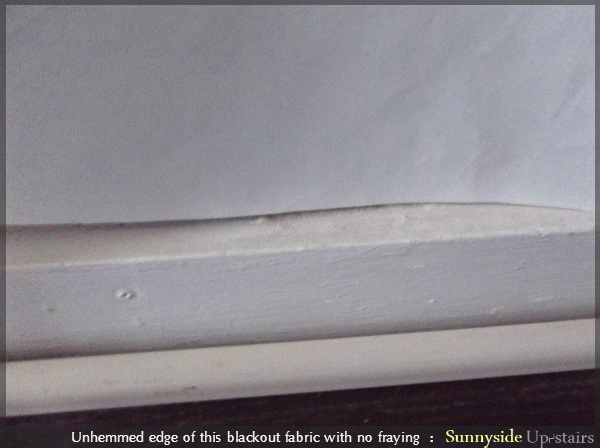 Easy explanation.For sound sleep of my children, blackout curtain is most important to me.I will replace my blackout curtain soon.I get some info and tips from this post.I will try to use this info and tips.